In the last couple weeks since posting my first macaron blog I have been making batches of these delectable treats and bringing them into the office for quality testing. Having no short supply of taste testers the results have consistently come back positive. I have to admit that watching the reaction after someone bites into them is very satisfying. Thank you all for being such willing tasters! As a result of bringing these samples in, I was approached to make a few for client gifts. A “few” quickly turned into 240 and suddenly found myself preparing for a macaron marathon to get them all done in one day with only 1 macaron mat. I haven’t been successful enough to only bake them on parchment so it’s going to be a looong day ~ hopefully only 1 long day. I started with prepping all of the ingredients. What you see to the left of the eggs is a sifter. Yes, it’s a new addition to my kitchen gadget collection but one that will prove to be a much needed one. I remember my grandmother having a similar one but hers had a trigger instead of a crank. Much easier to use and less messy than a hand sieve. Fortunately, I had some takeout containers so that I could pre-measure everything and have it ready instead of measuring each time I had to prepare a new batch. By my calculations, I should have to make 8 batches so that I would have enough for 2 batches x 4 different flavours. I made the ganache flavours the night before and will have Chocolate Mint, Chocolate Espresso, Chocolate Orange and Chocolate Raspberry. I did test a White Chocolate Orange ganache that I took to the office, but I have to admit, I really don’t care for white chocolate. Everyone who likes white chocolate loved it but I find the consistency of the ganache that I made to be somewhat sticky, more like a custard, and it oozed out of the shells when the macarons came up to room temperature. In my opinion, that flavour will not be a good addition to a gift box that will go to clients if it might ooze out onto the other ones. My preference will always be dark chocolate over any other chocolate, every time, any day. The challenge: 8 batches of macarons completed in 1 day. Let the Macaron Marathon begin!! The first batch was a disaster. What went wrong? All the other batches I had made came out perfect, so what did I do differently? Maybe I’m just anxious that I have so many to make? It’s like making pancakes or waffles ~ the first one usually sticks or burns then the subsequent ones are perfect? First off, the weather is overcast and rainy, that could be part of the problem. I’ll have to let them dry longer, at least 20 minutes instead of 15. It can take up to 30 minutes for the shells to dry on a really humid day. Oh yeah, I should turn off my humidifier too because that’s not helping the situation. 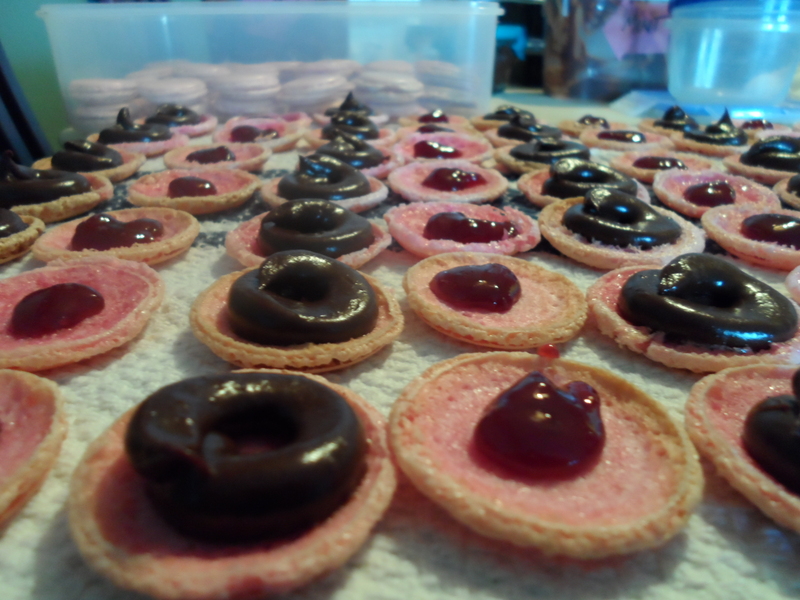 Secondly, I used a silpat mat under my macaron mat which was probably why they were gooey and didn’t cook properly. Don’t know if that is a true factor but I never used one when I’ve made previous batches to take to the office so eliminate that as a possible factor. Has anyone else noticed that whenever you cook something on a silpat mat, whatever is along the edges gets a bit scorched? Maybe it’s just my oven. This batch is going to be a do-over. Good thing I have plenty of ingredients. Getting the timing on how much to pour is also a bit of a challenge but I’m up for it. Second batch was much better. Each batch seems to make approximately 15 minutes to mix, 20 minutes to dry and then 17 minutes to cook, 5 minute cool down and I have to keep the pouring consistent. Multiply this by 10 since the first batch was a disaster and I will have to deal with breakage, scorching, cracked caps and imperfections, so I may have to mix even more extra batches. We’ll just play it by ear and keep count. Darn, have to run out for more eggs, maybe I’ll pick up a roasted chicken too so I’ll have it handy when I get hungry. That’s going to cut into my timing. Need to prep the ingredients for a few makeup batches just to be on the safe side. Oh yeah, and turn off the humidifier. Had to turn the oven down to 350˚. My oven seems to run hot and 375˚ scorches the caps. Some are coming out hollow which means that I’ll have to whip the meringue to soft peaks and work the batter a bit more during the macaronnage stage to get more air out of the meringue. 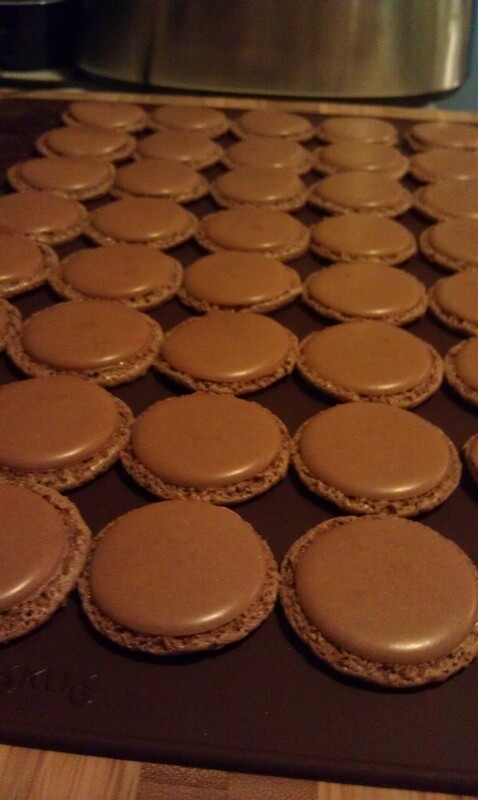 My right arm is really going to get a workout this weekend with all the macaronnage I’ll have to do. That will be 15 or 16 batter shmears around the bowl for each batch x 10 batches. This is going to be a looong weekend! As the macaron marathon continues my mind wanders to the recipe. One that I will know by heart by the time this weekend is over. The recipe calls for “aged” eggs. If you are unsure what that refers to, it’s leaving your eggs at room temperature for 2 to 3 days. One of the things I noticed in Europe is that the eggs are never (or rarely) refrigerated. I have always seen them just stacked on the shelves. That is unheard of in North America; at least I have never seen eggs that have not been on refrigerated shelves. Needless to say, leaving eggs on the counter for 2 or 3 days really goes against everything I’m used to. I start shaking after 1 day and at 2 days begin to wonder if they’re on their way to going bad. Apparently, aging them will help the meringue be fluffier. It’s supposed to be easier to separate the white from the yolk when they’re cold but, I haven’t really noticed. Make sure you don’t get even a tiny drop of egg yolk in the whites because your meringue will NOT get fluffy. Don’t know why, but it’s true, firsthand experience. One good tip to know is that if you get eggshell bits in your egg whites the best way to scoop them out is to use a piece of eggshell. I’ve noticed that certain liquid food colours bake better than others. Green tends to scorch easily and fade, red is fabulous, yellow and orange are great and chocolate looks good but doesn’t always rise evenly. Half way through the day the rain stopped so now I can reduce the dry time to 15 minutes. That should cut the marathon time down a bit. If each recipe requires 3 egg whites… what am I going to do with 36 egg yolks? Ice cream? Zabaglione? Egg yolk mask? Whew! Worked until 1am finishing the shells. Total time spent: approximately 17 hours! Day 3: 3 hours to bake one last batch of chocolate shells and assemble all the macarons and add a touch of sparkle dust. 3. Chocolate bakes a bit thicker and they are more delicate to handle when they cool off. The tops also do not bake evenly flat like the other batches did. 4. Chocolate espresso ganache is a bit runny and I will need to add extra chocolate for it to be thicker at room temperature. It must be because the recipe calls for ¼ cup of espresso. I did manage to find more Lékué mats but they only came in after the marathon ended. Junors located at the Shops at Don Mills in Toronto has the mats but not the large Decopen. You’ll be disappointed if you purchase the small Decopen as it’s less than half the size of the large one. Unfortunately, not all Lékué products are available in Canada but they do have a lot of cooking and entertaining items. It was all I could do to only buy what I had asked them to put aside for me. Posted in desserts, MacaronsBookmark the permalink.